Back and front views of the piece I sent off to the North Carolina Pottery Center for their annual auction. 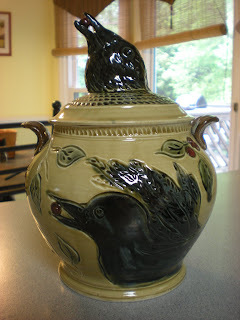 It's called "The Theft" and illustrates my fascination with crows and their amazing personalities. I think they're in the "larger than life" catagory of birds. Very cheeky! The berries are a red clay that makes a nice contrast to the white background. Enjoy using it, except for it's tenacity to stain your hands and anything else it touches. Some of the finished tree covered jars. I've been immersed in reading about all the ways to coordinate your web presence through social media, blogs, websites, profile pages, etc. This is in an effort to make my website more effective and to introduce an online retail site. It also comes as a result of a long conversation with a friend about ways to improve retail services/sales for my husband's business, Wilkinson Animal Hospital. I've been pretty actively involved in his business since it opened in 1987. I even was a receptionist for a summer. But now I do his bookkeeping and take staff photos and lots of other small jobs. Since it's our main source of income it tends to take priority over the amount of time I have to spend in the studio, depending on what's happening at the vet hospital. But it's also flexible in the hours and that compensates for the time out of the studio. Lots of ideas churning around about "optimizing our web presences" for both businesses with out it becoming another time sucking machine that keeps us from doing the things we love most about our work. My to-do list is fairly long, so I better get moving! Why don't you let me sit in the front seat? It would be so much easier to lean my head out the window and eat your french fries and tell those cheeky dogs how fast I could run if we were to race. Got a little crazy around here last weekend. Luckily only had minor breakage and I think my tile furniture is still usable. Just use this link to find what I'm tweeting about! 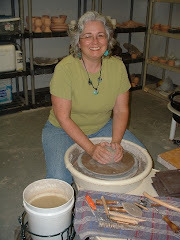 I touched clay and it was like coming home. Not to say it was easy or without challenges. It just "felt right". 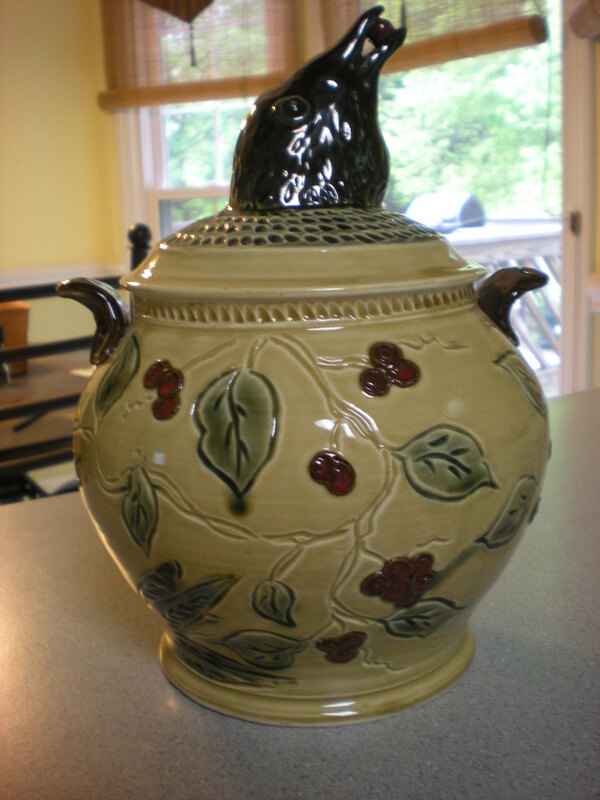 I started making pots around 1995 and selling my work in 1997. I like making functional work that folks will use and enjoy. There is a lot of carving and texture that goes into the work and since I have a background in painting and drawing, a lot of use of color and line to decorate the pieces. I'm amazed when looking at historical pottery what has been done and thought of in the past. We think we created abstract ideas and images in the twentieth century, but a 10,000 year old pot proves us very wrong. I love the surprise of this medium. Studio and gallery hours are 1:00 to 5:00pm during the week and by appointment on the weekend. Often you will see the lights on and the Open sign at later times, so feel free to stop in if I'm there then. If you are making a special trip to Gastonia during regular hours, call to make sure I'll be there when you want to come. Since I do everything from making glazes to mailing packages, I sometimes have to leave the studio to handle the gallery errands. You can reach me at 704-824-9928. Find out great things to do in your area in this fun book!